Specialising in rentals, motels, baches, residental and light commercial, new homes, roofs, waterblasting, wallpapering, & building work. Rotorua and the wider area. Happy to travel within Bay of Plenty, but understand­ably travel costs will apply if outside Rotorua area. We are a small company located in the Rotorua area, providing a price-competitive professional service. Door handle gone through the wall? kid's bike damaged the plasterboard? no problem, give us a call. I can also help you with small building work. We can organise your job from start to finish, we take the headache out of you having to organise different tradespersons. Rob did a great job painting the exterior of our new house. The linea cladding had been on for over a year but he got straight in and has done a wonderful job even though it was winter and the weather was against him a lot of the time. Will use him again! Rob and his team just finished painting the exterior of our house and they did a great job. The paint finish is amazing and the communication with Rob was better than I could have hoped for. Would recommend and definitely use again and again. Rob recently painted several areas in my home and I found him to be helpful, willing to please and always ready to go the extra mile. I have no hesitation in recommending Rob as an honest and efficient worker. Thanks for a job well done Rob. Rob did a great job.clean professional and good advice,good to get on with.will be recommending rob to all my family friends and clients.last but not least great price too.thanks Rob. Highly recommend. Fantastic job. Very considerate and respectful. Professional, polite, reliable, skilled. Highly recommend. Fantastic to work with. Great communicator, Happy to give advice and takes the time to listen to what you want. Would definitely recommend him to others. Rob has just completed some interior painting for us. 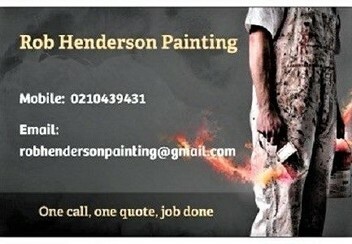 I would have no hesitation in recommending him to others looking for a painter. A very trustworthy and friendly person with great attention to detail. You won't be disappointed. Thanks Rob for a great job repainting the linea on the outside of our house and a couple of other bits inside. Lovely guys to deal with, who were more than happy to accommodate any situations that arose. Very nice and friendly, would highly recommend. Thanks Rob for the great job you did painting the interior of my home. I would highly recommend Rob and gladly use him again! Rob does a professional job and doesn't cut any corners.Very thorough, trustworthy and reliable.Thanks, we are really happy with the bit of plastering and painting you completed for us. EXCELLENT JOB! Would highly recommend. Rob did some major repair and painting on a rental property and took photos of the job before and after and emailed them to me which was so convenient. Thank Rob!